Total Workshop search results: 41. Displaying Page 1 of your woodworking search phrase CHILDRENS ROCKERS. Our Giraffe Rocker Plan is sized for children 2 to 4 years old. Simple construction from 3/4 and 1-1/2 inch lumber. Order one dowel for the handle separately below. 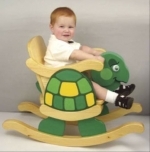 The plan says: Fun for the little ones, our new turtle rocker is low and safe for rocking. It is 18 inches high and 26.5 inches long. The mischievous expression on Mr Turtles face cannot help but amuse your youngster, and the sturdy toy will have good lasting qualities. The little rumble seat compartment will hold a favourite animal which can ride along. Simply trace the pattern onto 3/4 inch stock, cut it out and assemble it in an evenings time. Transfer the turtles markings at the same time and once assembled, paint in shades of green, yellow, orange and black for a fun toy. Children will be able to climb in their own seat and rock away. Add the painted details in layers or simply paint them on the side. There is also a bonus seat in the back for their favourite teddy bear or doll. Or use it to store some toys. Also, a secret space for children to hide away small treasures. Full size drawings! This rocking dog is sized for children from two to four years old. Straight forward construction from 3/4 inch and 1-1/2 inch pine make this project simple to construct. Patterns drawn FULL SIZE. 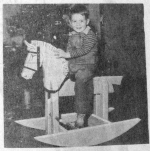 Pony Rocker Vintage Woodworking Plan. The plan says: Here is a gentle steed for the very young, close to the floor and fall proof. You can build it in an evening or two. And baby will ride for many days. Full size pattern simplifies the laying out of curved parts, cutting an assembling. Seat height from the floor is 7 inches. 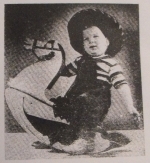 The plan says: If you want to make some child dance with joy - make this hobby horse. Its a four star winner with every little boy and girl. The enclosed full size pattern not only simplifies cutting each piece to size and shape needed, but also insures painting face and mane with a professional touch. An old felt hat can furnish material for ears and eyelashes. List of materials printed on pattern. Rock em Cowboy Vintage Woodworking Plan. The plan says: Junior will be delighted with this hobby horse of modern lines. It is a simple project when you have the help of this pattern with full size layouts of head and rocker to transfer to boards 3/4 inch thick. Assembling and finishing is done quickly. Children will be able to climb in their own seat and pretend to be carried away on their elephant ride. Add the painted details in layers or simply paint them on the side. There is also a secret space for children to hide away small treasures. Full size drawings! 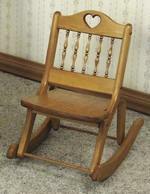 Little Duckie Infant Rocker Woodworking Plan. 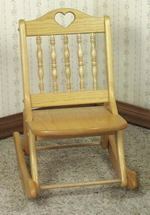 Our newest Infant Rocker project, based on our popular Little Duckie plan series. Order black eyes and birch dowel for handle separately. This is a vintage woodworking plan. Visit our FAQ page for a full definition. View the Larger Image Slideshow to see the actual item you are buying. This story book house or yard mule lacks a mulish disposition. He was designed for childrens safety. His rockers give him perfect balance, guard against his throwing the rider, forward, backward or sideways. His ears are pivoted. His tail is a back rest. The handle-bar and foot-bar make it easy to hang on. Hi is 46 inches high from the floor to the tips of his ears. This craft pattern making building easy, with parts in full size to trace onto wood. Use stock lumber and paint him in bright colors for a lasting Christmas gift. You can dig up all the material you need at a local home center or lumber yard to put together this prehistoric project. Even your child can help in the construction because all part outlines are shown in full-size on the plan. Simply trace the parts to pine lumber, cut out with a saber or jig saw and assemble with glue and wood screws. A color scheme of green for the body, yellow for the rocker stand and eyes, red for the neck and tail plates and blue for the seat and handle bar is suggested, but you may also use semi-transparent stains to let the wood grain show through. The dinosaur is sized for toddlers to six-year-olds. This is a vintage woodworking plan. Visit our FAQ page for a full definition. View the Larger Image Slideshow to see the actual item you are buying. Ken designed this rocking ham to be built without a seat, just in case you would like to build it without the rockers to display it in your yard. It is just wide enough to sit on comfortably without a seat. The plan does show the option if you wish to cut in a seat. View the Larger Image Slideshow for pictures of the actual plan. 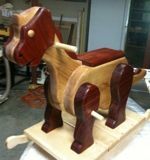 Iron Horse Rocker Woodworking Plan. Your child can be the engineer on his or her own train. Designed for 2 to 4 year olds. 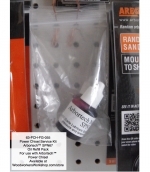 Make from standard 3/4 inch and 1-1/2 inch stock. Plans drawn full size. After many requests for the smaller versions of Bessie the Cow and the Old Grey Mare rockers, we made the Baby Bessie and Mini mare. They are both here on one set of plans with separate wood parts lists and instructions. 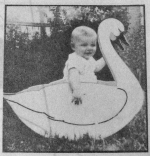 Ideal for toddlers, this plan includes two rocking horses with low 15 inch seats. Includes full size patterns, list of materials, photos and instructions for two horses. View the Larger Image Slideshow for pictures of the actual plan. 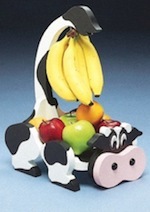 Fun to make as a rocker or as a stand alone bull yard art project. Buford is a big lovable animal. No carving necessary! View the Larger Image Slideshow for pictures of the actual plan.